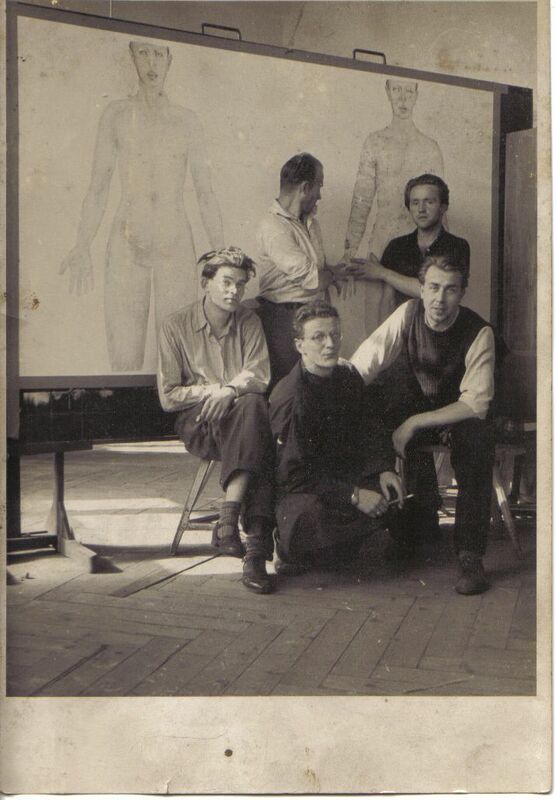 The beginning of Josef Lehoucka's artistic activity is closely connected with the orientation of the students in Frantisek Tichy workshop at the Academy of Arts, Architecture and Design in Prague who were then under the influence of surrealism, in some cases – the influence was preserved to a various extent for their future life as well. These students were Mikulas Medek, Stanislav Podhrazsky and Zbynek Sekal. Lehoucka appears with two of them in a group “Maj” later on. However, he chose the path of a relative solitaire very soon. The term “relative” is used because he could not deny the common origin, he remained faithful with this origin in a specific way for entire decades but he even extended the spectrum of surrealistic inspiration by new initiations and relations. He drew not only from the international sources but also from the domestic ones. Apart from surrealism and structural abstraction, he was connected with the domestic scene by means of a perpetual tie of the requirement of artistic freedom. Whatever the explanation would be, Lehoucka's notion of freedom includes also the right to be outside the mainstream – from time to time, to choose separately and individually his orientation goals, to combine different things so that they correspond with creation of specifically formed rich imaginative world of his own. A closest connection of realism and fantasy are characteristic features of Lehoucka's paintings. Factual world in his pieces of art must become present today and daily in various ratios of the both parts. It is definitely a certain heritage of “communicating vessels” of reality and dream in surrealism; however, Lehoucka gives his own interpretation to this “communication” which lies in acknowledging the objective values of a life scene in the sphere of a spiritual life of a man. Often, the real world creates a sort of salvation from a frequent suicidal phantomism of a free figurativeness. Vicissitude of brave escapes into spheres of open-eyed dreams and soothing exploration of a quiet beauty of a material life environment – that is what engraved into Lehoucka's paintings that unique feeling of harmonic balance between the antithesis of the definition of existence and visionary overlapping – which is so peculiar to a human life. At the beginning of the 1960s, when abstraction started, Josef Lehoucka – then working as a crane operator in CKD Sokolovo plant – did not hesitate to narrate in his structural pictures the stories of machines which he was in a daily contact with. He simply needed that his painting was signed also with the truth of the author's everyday existence. Opposed to traditions of surrealism, he did not portray these mechanisms as phantomatic machines but as the reality of the current civilization that is based on exact thinking of engineer drawings. Artist is able to engrave even this into his works. Walking on this specific path, Josef Lehoucka could not have missed the initiations of actual artistic streams, especially pop-art, which rehabilitated the visual scene of reality in a program-like manner. It soon became obvious in Europe that the predicative value of the real world is something that the art cannot afford to lose. However, a certain critical distance and irony were far from gracious understanding of complexity of material and spiritual realities of the world in the way understood by Josef Lehoucka. In this aspect, a veristic surrealism and partially metaphysical painting were more akin to him since these were the ways in which the artist saw the path to join the above mentioned antithesis of reality and dream. In this relation we cannot miss the power of initiations which were acquired by Josef Lehoucka through contacts with the works of Frantisek Tichy because the works held his interest due to that guided and perpetual relation to reality. This is the origin of Lehoucka's intentionally cultivated feeling for culture of artistic performance which defines the shape of even the smallest painting. In accordance with the feeling of the times and reflection of systematic solitairism, Lehoucka increases the culture of expression up to the level of a manneristic artism since it is in it itself where he sees the guarantee of freedom to mix the picture cocktails of reality and fantasy exclusively according to his own instantaneous state of mind and will. There are not many pieces of art that would open themselves so widely to charms of the entire world and to fascination of the artistic experience at the same time. Lehoucka's painting thus resembles a crystal magic ball which may be observed by us from all sides and we are always surprised by finding something completely new. One thing is connected with another, one thing is hidden and then brought up to the surface of consciousness by constant sparkling on different poles of the artist's synthetic meditation about the relation between the renewed eternal autonomy of the art and the life scene. This is the aspect in which Lehoucka achieved considerable results that enriched the Czech art and brought a new position which is without any doubt to its credit.